These two beautifully presented companion board books are created for preschoolers. Thick and durable pages are perfect for frequent handling. They introduce the very young to playtime, and bedtime rituals, with five open-the-flap pages that extend the main picture. Vivid colour fills every page and reflects the joy of early childhood, and the freedom to dream and imagine. Playtime with Ted shows Ted sitting in a cardboard box. But for Ted the box is a racing car, then a digger. As the day progresses, it becomes a noisy submarine, then a train in which his toy companions join him on a journey limited only by his imagination. 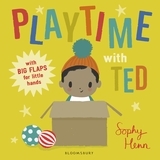 Closing with a trip to the moon at the end of the day, this delightful book is ideal daytime reading with a parent to encourage play and creativity. 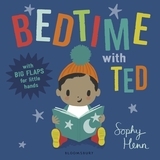 In Bedtime with Ted, we find the same format again with big flaps to open. The same toy animals accompany Ted through the book as he prepares for bed. First he has his bath with the penguin, and then brushes his teeth with the crocodile. A glass of milk with his tiger brings him up to a good kangaroo jump on the bed to get rid of the ‘fidgets’. Then, it’s everyone in bed and to sleep! Sophy Henn’s fabulous characters and illustrations are full of gaiety, fun and learning. Compact and cuddly, these two books will become favourites; carried under little arms and between hands, to be enjoyed over and over again.